I started reading this novel late night on weekend and totally sucked into the whirlpool of the story. Hell! 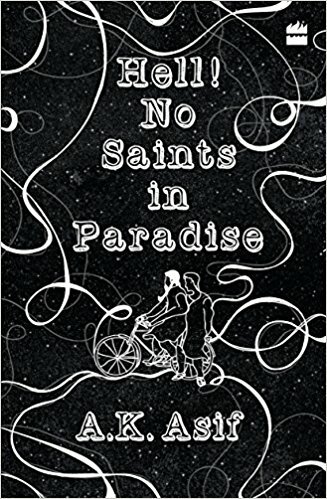 No saints in paradise is basically, a dark dystopian satire based on Islamic extremism. In not so distant future, Pakistan turned into caliphate of Al-Bakistan under the rule of a khalifa. People follow shria law to its core and anyone who don’t comply even a shred of the law branded as kafir and killed mercilessly. Ismael, a Pakistani-American working on his PhD thesis with the sole purpose of rebuffing Islamic concept of Hell and Heaven. In certain set of events and in trance state (after ingesting Alahuasca, a psychedelic drug which induces hallucination), agnostic Ismael met Chacha Khidr who motivated him to go on a journey of self-discovery and redemption. Ismael agrees to be a part of conspiracy, which can potentially save the while world from unknown yet potent danger. What intrigued me most is how the author picked up references from Quran and created story around it. Being a Hindu, I found these references fascinating, it gave me access to almost untouched territory of stories and mythologies scribbled in this Islamic holy book. Another interesting thing is the first person narration of the protagonist Ismael. This book is a chronicle of Ismael’s journey, his adventures, misadventures, realization and redemption. First half of the novel is very well written. You will feel the influence of Salman Rushdie present in the novel in the form of super natural beings like Chacha Khidr and Pir Pul Siraat, parallel realms like Dump, heaven and hell, space-time fabric of the universe. Author effortlessly wrote about fantasy interlacing it with the probable reality. Second half was inconveniently fast paced, I felt like there was an attempt to finish the story in a limited word count. I was enjoying the subtle flow of the story and suddenly overwhelmed by the torrential flow in the last part of the story. Talking about the dislikes, I was really not able to understand the sudden change of heart of Ismael. First experience of hallucination, one dose of Ayahuasca and Ismael turns into ardent believer of the higher cause and agrees to jump into black hole. I was expecting that author will eventually elaborate this rapid change in protagonist’s life path but found none. There was a strong reason why Ismael became agnostic, why he repels the idea of heaven and hell. This reason was lost at some point in the story and Ismael became a mere instrument in the hands of Pir Pul Siraat and Chacha Khidr, obeying the commands and doing all dirty work. I wanted to read the depth in Ismael’s character but it felt like he was chosen only because his father was someone important in the inner sanctum of caliphate and not because any of his personal virtues. 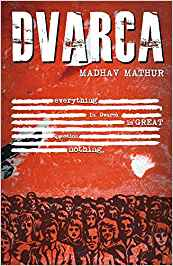 All in all, enthralling story with high imaginative quotient, action packed climax and intelligent blend of fiction, mythology, science, religion and fantasy.